McDonald's Move May Make Healthy Business Sense The company says its decision to add apple slices to Happy Meals by default came at the request of customers. But it also could help keep the company's bottom line intact, analysts say. 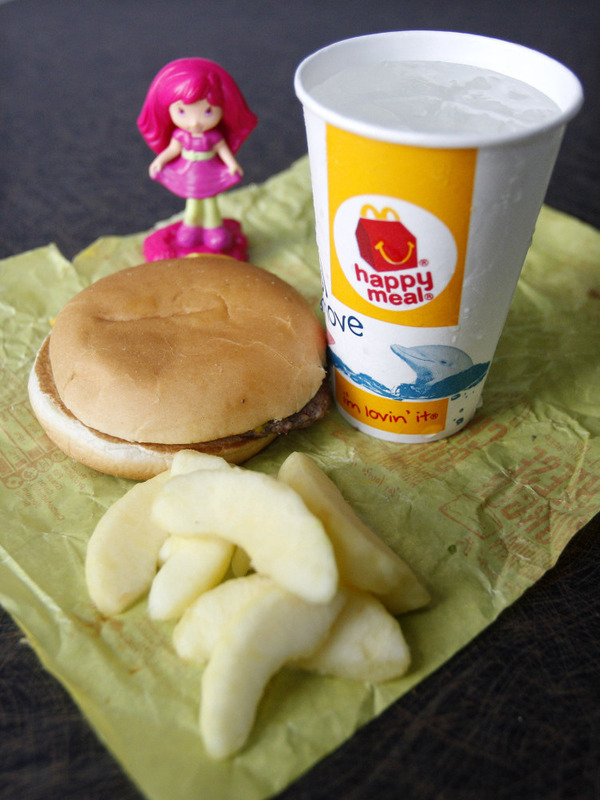 A McDonald's Cheeseburger Happy Meal with the new apple slices option is shown Tuesday. McDonald's Corp. says it is adding apple slices to every Happy Meal, part of the chain's larger push to paint itself as a healthy place to eat. When McDonald's announced Tuesday that it would make the standard child's Happy Meal more healthful, company officials said they were responding to the desires of their customers. But the move also makes business sense, analysts say. "This is good publicity, and if you sell more Happy Meals, you're likely selling more Big Macs to the parents," says Peter Saleh, a restaurant analyst with Telsey Advisory Group in New York. Sam Oches, an associate editor with QSR Magazine, a fast-food industry trade journal, says McDonald's won't say how many Happy Meals they sell, but they're rumored to account for about 10 percent of sales. "They do more than $32 billion in sales every year, so Happy Meals are potentially a $3 billion chunk of that," Oches says. "That alone is more revenue than a lot of big restaurant chains." For McDonald's, it's about holding on to a loyal customer base, one that has grown up being exposed to the Golden Arches. "McDonald's has done great through the recession, they continue to grab market share and have had the cash to remodel their restaurants, while some of the other fast-food restaurants have struggled to keep up," Saleh says. But the competition hasn't been standing still. The National Restaurant Association launched a similar initiative for healthier kids' choices earlier this month, pre-empting McDonald's. Among those signing on to the "Kids LiveWell" campaign are Burger King, IHOP, Denny's, Cracker Barrel and Sizzler. And somewhere out there is an apple supplier who is even happier than the kids. "The sheer size of McDonald's supply chain is kind of nuts, really," says Oches. "You've got 14,000 stores, serving apples in every Happy Meal," he says. "You do the math. It's huge." To be sure, healthier options at McDonald's have long been there for the asking. A parent could request fruit or milk instead of a soft drink, but most opted for the traditional meal by default. The big change is that the new Happy Meal will automatically include a quarter-cup of apple slices and about half as many french fries as before. Upon request, parents can hold the fries and get twice as many apple slices instead. The move also should help ease criticism the company long has faced. In a study released in November, the Rudd Center for Food Policy and Obesity at Yale University listed the most nutritious Happy Meal at only 30th on a list of the healthiest meal combinations. The study was critical of the fast-food industry for its unhealthy kids' menus and for directing the power of its marketing at children. "We found some pretty remarkable things," says Kelly Brownell, the center's director. "The average preschooler is subjected to 1,000 advertisements each year for fast food. No amount of education from school or from parents can compensate for that." "It's a reasonable first step," Brownwell says of the changes. The original version of this story reported that milk would be included in Happy Meals by default. Milk will be among the beverages available with Happy Meals, but the choice will be left to purchasers.